Sugar cookies are a bit underrated. They seem so plain when they’re put next to a cookie loaded up with chocolate chips or nuts. But sugar cookies are still one of the most popular cookies out there because underneath that plain exterior is a cookie that has some great flavor in spite of its simplicity. Most sugar cookies are made with white sugar and get their flavor from butter and vanilla added to the dough. I really like that simple combination of flavors in a chewy and tender cookie. These sugar cookies are made with brown sugar, so while they’re as simple as their much paler counterparts, they have more flavor than you’d get from your average sugar cookie recipe. The sugar is the star in these cookies, although they’re not as sweet as you’d expect from a cookie that makes sugar the star. They’re just sweet enough. I used golden brown sugar, which gives the cookies a slight butterscotch note. If you use dark brown sugar, you’ll get a more distinct molasses note in your batch. The cookies are soft and tender without being cake-like, and they have a nice chew to them. Rolling them in sugar (white sugar is best for rolling) before baking doesn’t add much additional sweetness, and doesn’t take away from the overall flavor, but gives the cookies a nice crispness right around the edges. I’ve made these cookies with half white whole wheat flour with great results. In fact, I would definitely recommend trying it that way to get a hint of nuttiness into the cookies if you have white whole wheat flour in your pantry. I do like the texture that you get from using all purpose as opposed to an all whole wheat cookie here, but the wonderful thing about this recipe is that it a great jumping off point to do a little experimentation of your own to customize them to your tastes. Roll the cookie dough in sugar and spices before baking. Use whole grain flour. 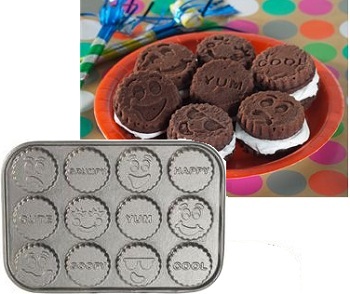 Use them to make ice cream sandwiches. But above all, enjoy a good sugar cookie. In a large bowl, cream together butter and brown sugar until light and fluffy. Beat in eggs, one at a time, followed by vanilla extract. Gradually blend in the flour mixture until dough comes together and no streaks of dry ingredients remain. Place sugar in a small bowl. Shape dough into 1-inch balls and roll in sugar before placing on baking sheet. Allow about 2-inches between cookies to allow for spread. Bake for 11-14 minutes, until cookies are set and very lightly browned around the edges. Allow cookies to cool on baking sheet for 3-4 minutes, then transfer to a wire rack to cool completely. Store in an airtight container. There is nothing quite like a good sugar cookie and these ones look like they are very, very good!! I will have to give them a try this weekend! i have been making cookies like this forever because i always thought the best parts of chocolate chip cookies were the bits around the chocolate chips. my boyfriend and i call these chocolate-less chocolate cookies. and i second the white whole wheat flour, it imparts such a great flavor. I haven’t tried white whole wheat flour, but will put that on my next grocery list. 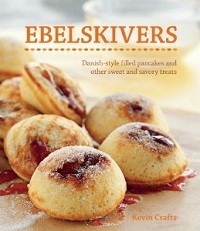 These cookies sound delish, I love the simplicity and purity that they impart. Great post! I am going to try these cookies. They sound simple, but delicious. And I also love adding half whole wheat in my cookie recipes. Thanks for this recipe- I rolled them in raw cane sugar and they were still a great mixture of chewy/soft on the inside, crunchy/crackly on the outside. Baking time is really key, I found- I underbaked my first batch, and the taste really suffered for it (moreso than it normally does with cookies). These turned out fantastic! i rolled them in both raw and regular sugar but only on the top so it gave a nice topping. i had a lot of co-workers telling me that they did not like sugar cookies, but they fell in love with these because “they weren’t too sweet”. These came out great. I had a few that spread too much and I found that if I flattened the dough just a little bit before baking it seemed to help. They were a big hit at Easter dinner! These cookies just came out of my oven and they are absolutely fabulous! Wonderful recipe. The cookies are perfectly chewy but soft, crisp and fragrant. Thanks so much for sharing this recipe – It’s definitely a keeper! I keep searching for the best sugar cookie recipe but I haven’t found one I love yet. For your recipe, can you roll it out (1/4″ thick) and use cutters and do they spread a lot after baking? I want a chewy cookie that will retain it’s shape. Can you exclude the vanilla???? 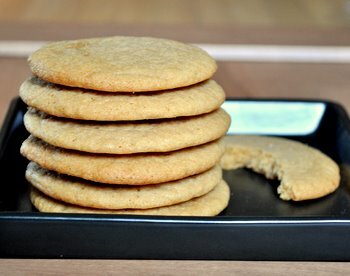 Just baked Brown Sugar cookies–followed recipe–(only made 1/2 – yelded 24 cookies) Crispy on outside and soft on the inside. Second Batch: I imediately put on wire rack to cool-cookies still good and not as crispy on outside (which is the way I like them. Hint: Cream sugar and butter for 4 minutes. Make sure everything is at room temperature. These were really good.